This game is a clone of the classic "Tetris" game. Except it is made for the web. You can start playing this Tetris game from any Java-enabled browser on any computer from anywhere in the world. Use the left and right arrow to move the blocks left or right. Use the down arrow to drop the blocks. Use the Ctrl or the Shift keys to rotate the blocks. To start the game, click on the "Play" button above. 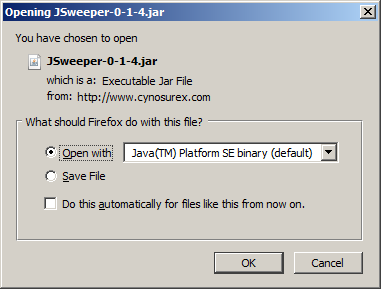 If you see the following dialog box, select "Open with Java(TM) Platform SE binary (default)". If that works, in the future you can skip this step by selecting "Do this automatically for file like this from now on". If you don't have Java installed, following the "Easiest Way to Install Java for a Browser article. For more information, support, feature requests, bugs, source codes, etc., consult the FaTBloG project page.